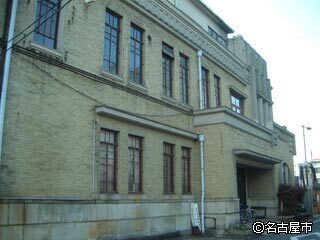 The building was designed by Kazuhide Takasu, a former protégé of Teiji Suzuki and later one of the founders of the Meijo University, Faculty of Construction Engineering. It is indeed one of the better-known examples of expressionist architecture in Nagoya. 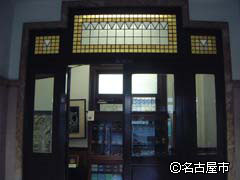 The plans for the Nagoya Ceramics Hall indicated it was made of polished artificial stone, but given that it was built as the office for the Nagoya Ceramic Commerce and Trade Association, it ended up being finished with scratched face tile. The interior retains an art deco flavor, featuring relief art ceiling. On the first floor, a gallery and china painting workshop are prominent attractions, while the building is home to many design-related business tenants. Since 1877, the Higashi Ward area had a thriving ceramics industry. In particular, pure white ceramics bought from Tajimi and Seto were painted and exported to overseas markets. Following the Sino-Japanese war in 1894 and 1895, ceramics further solidified its position in the area, and fully 80% of all ceramics exported from Japan around 1933 and 1934 was produced here. According to Nagoya customs statistics, ceramics outperformed even cotton textiles as the top export item from Nagoya Port in 1937, a position it retained until the late 1930s and early 1940s. A large number of these fantastic one-exported ceramics are now on display in the Nagoya Ceramics Hall first floor gallery, and are well worth a look. <City Bus> 3 minutes' walk from "Akatsuka"